The original plan had been to go sailing for a couple of days – but Boat jobs always seem to take longer than planned. But we left Mylor and headed for one of our favourite anchorages for lunch. 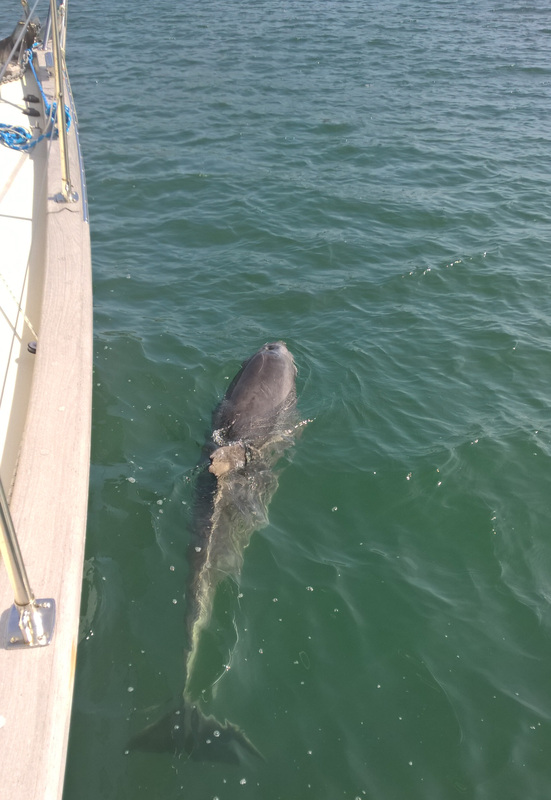 There wasn’t much wind – but enough to get the main up – which was just as well as we realised that a bolt that holds the mainsheet track onto the boat had come lose. So we quickly tightened that – but rather glad it wasn’t windy. But the wind soon died and we motored into Durgan Bay on the Helford River. We dropped the anchor and had lunch. I suddenly heard the blow hole of a Dolphin and turned round to see its head out of the water looking at us – clearly curious as to what we were. I have only ever seen dolphins interested in boats that are moving not ones at anchor. I rushed for my camera and it swam very slowly along the side of the boat. As I lent over to take a picture – it stopped cocked its head to look at me then swam slowly off. It was really amazing – it swam close by for a short while then headed off. It was soon time for us to do the same and we headed back to Mylor. The next day we left very early but it was quite amazing to think that the next time we would see Carra was in Kiel. On the way to Heathrow we popped in to visit Sue and Neil in their new house in Wiltshire – it was lovely to see them and catch up with her and have a fab brunch to set us up for the return to Finland. Mags had come over to the UK early and spent Monday servicing the engine under Gary’s watchful eye. Tuesday Peter and Chris – who were due to take her over to Kiel for us, helped Mags launch Carra and take her round to the Marina. With it gusting over 60 knots in Carrick Roads I was rather glad not to be parking her! I arrived on Tuesday evening as I had been working in London. Wednesday – we put the last of the halyards on – but true to form it didn’t go smoothly – so I had to go up the mast as the mousing wire had come off the block. 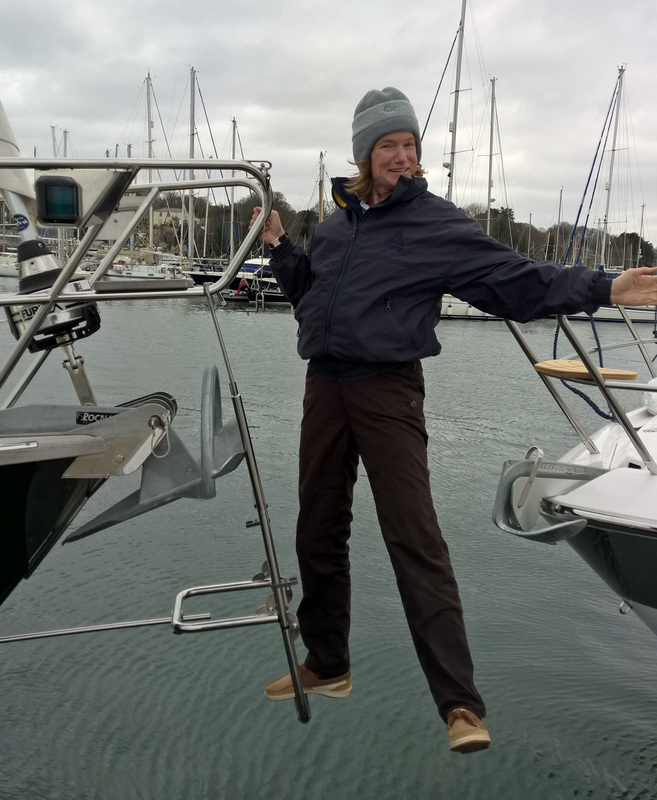 It was still too windy to put the sails on – so we spent the day doing boat jobs. This included putting on all the Baltic kit. Mainly the stern anchor and the anchor roller. By the time I was nearly finished it was getting dark and a moment of lost concentration and one screw went plop as it fell overboard. Next time we would use the bow ladder in anger would be in Sweden. By Thursday the wind had abated and we were finally able to put on the sails – though we did need to turn the boat around due to the wind direction. The next task was provision her for the big trip – Mags was in her element. We knew that this would be the last time for some time we would have a car – so we took advance of buying all the dry provisions we would need for the season. Also Carra was a convenient way of getting some British goodies over to Finland. 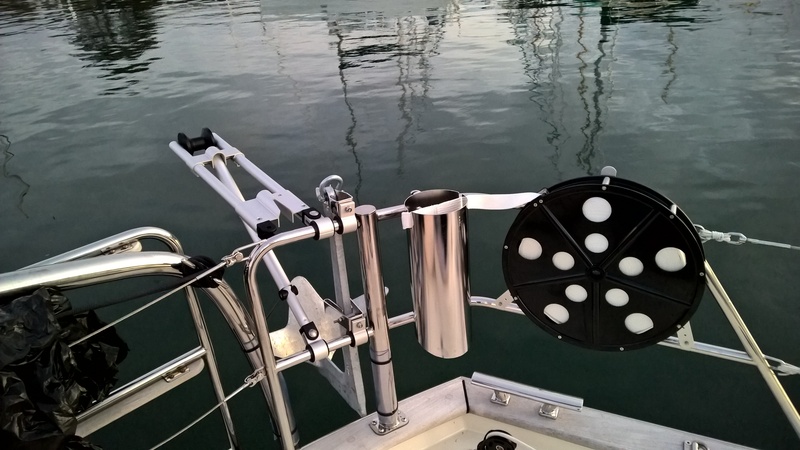 When testing the nav lights – I noticed the stern light had gone so that had to be fixed. Before we knew it – it was Saturday before we had finished all our jobs. All that was left to do was a test sail.